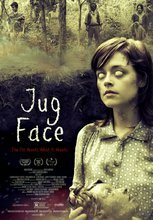 A pregnant teenager attempting to escape a backwoods small town learns of her potential sacrifice to a pit-dwelling mythical creature. Ada, a young woman hailing from a god-forsaken backwoods pocket of the Deep South, finds herself preoccupied with a desire to escape her rural community on account of a pregnancy and subsequent status as a pariah. Unfortunately for young Ada, her town plays host to a pit-dwelling creature that demands the sacrifice of one of its inhabitants every year in exchange for a reprieve from its terror, and when a series of murders begins to affect the town, Ada discovers she might end up as tribute.